At first glance, Sara Berman’s Lints look like sweaters. Tides of colour wash across them, suggestive of rain-washed landscapes. Occasionally awkward, here and there an arm shrivels to nothing, or the sweater sits square and seemingly sturdy on its calico backing. They appear abandoned by erstwhile occupants: literally disembodied. There is a strangeness to them and at the same time familiarity. They have a curious and affective attraction; it is an effort not to touch them. The Lints have been collected from the filters of industrial dryers from across London. Their washes of colour are formed from the debris of a multiplicity of human lives; look closely and you will see hair of all kinds, the odd found object washed out of a pocket, sand and the fibres of clothes that have been washed and worn, over and over again, all felted together with skin cells and human detritus. Each sedimented layer has its own possible story: in a city of moving bodies the Lints speak to the interweaving of disparate lives, to the manufacture and movement of commodities in and across place and space and to the tension between consumption and waste that is central to human existence. The Lints’ strange beauty stands in contrast to their original designation as waste. Close viewing invokes a visceral response, challenging us to recoil when we realise that yes, that is indeed pubic hair. 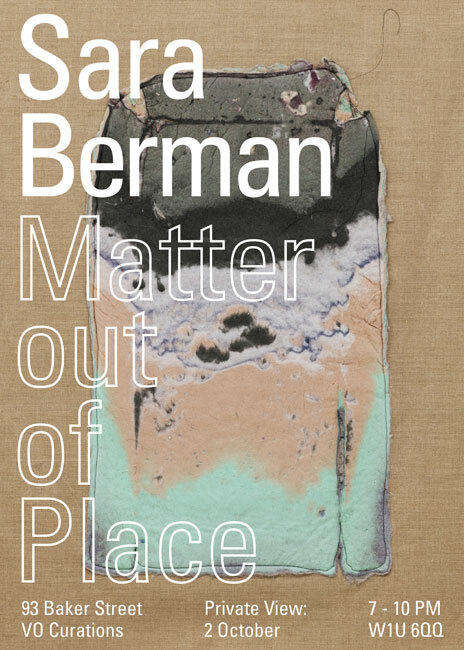 In repurposing them as art, as 'matter out of place', Berman creates a moment of radical provocation in which we can reflect upon the social decisions that frame our existence, on the compelling, organising power of disgust and its connection to intimacy, on the biopolitical necessity of drawing a line around order and cleanliness, a line policed here by the domestic machinery of the washing machine and the dryer. This is a line semantically connected to other kinds of border, such as those drawn around the social body, where metaphors of pollution and danger are attributed to problematic, marginal bodies, authorising the normative structures of power that we are told ensure national stability. By recreating waste – specifically waste in which the sheddings of bodies and their garments are combined – as objects of aesthetic beauty, interrogates assumptions about hygiene and order, and by association morality and propriety. These are assumptions which we all, as we reflexively clean, groom and dress ourselves, are collectively and conceptually engaged in constituting. Between order and disorder is always a liminal space, a place of generative power and transformation. In their corporeality the Lints literally embody this space, transgressing the socio-economic, cultural, political and spatial differences that might otherwise divide the bodies from which they are drawn. They expose the intimate reality of flesh, transforming aspects often designated as shameful when out of place or visible, such as hair, into something other, something beautiful. Moreover, they expose this as something shared across bodies of all shapes, colours, genders, classes, sexualities and cultures. In this way the Lints powerfully challenge ideas of bodily privacy and order and notions of disgust, upon which taken for granted structures of power rest.